Scenario 3 is the concluding game in the Shining Force III trilogy and, like scenario 2, was only released in Japan. The game concludes the story set down in the first two scenarios and is just as fun as them - perhaps a little more since the battles are more challenging. Despite only being released in Japan, there is a fan translation of the game which is available on this very site - check out the translations section. This time around, Julian is the hero of Shining Force III, a mercenary from the Kingdom of Enrich who has been searching for Galm, the Vandal who murdered his father. During the course of his travels, Julian joined Synbios' force and he eventually met Galm, whom he challenged. Unfortunately, Galm's vastly superior power meant that Julian couldn't defeat his nemesis and was cast into the flowing rapids of Barrand. Julian somehow survived the dangerous rapids and, after waking up downstream, he joined up with Medion's force, who were fighting a common foe - the Bulzome Sect. After news that the evil Sect had activated the ancient weapon Walcuray, and were launching an attack on the capital of Destonia, Julian - along with the Holy Child of Elbesem, Gracia - volunteered to journey to Destonia and save it from destruction. Shining Force III Scenario 3 follows Julian and Gracia as they attempt to save Destonia, Prince Medion and Lord Synbios. The game culminates in Julian's conflict with Galm and the final battle with the Vandal, Bulzome. Little change has been made to the battle system, as battles are conducted in the same way as in scenario 1 and 2. However, in scenario 3, using the X, Y and Z buttons on the control pad you can change the camera angles with which you view the combat scenes from - a small yet interesting feature to the game. The battles in scenario 3 are generally more challenging than those in scenarios 1 and 2 (although not overly difficult) and the synchronicity system gives the game lots of replay value. Like the other two games, scenario 3 is great fun to play. One of my favourite aspects of scenario 3 though, are the towns. The design of the towns is easily the best out of all three scenarios as each town has a different, and exciting look to it, from the palm tress in Baersol, to the bustling market-place in Guarder and the relaxing hot springs of Dormant - the scenario 3 towns are great fun to explore. Scenario 3, unlike scenario 2, is quite easy to find and is much cheaper than scenario 2 as well. It can be found at several online import gamestores and eBay, of course :). 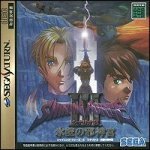 Jumesyn.net's complete walkthrough to the 3rd scenario of Shining Force III. Reviews of Scenario 3 (as well as other Shining Force III reviews). The scenario 3 translation is available at jumesyn.net as well as translations of various elements of the game (such as the battlecries).